Oxidation reactions are of fundamental importance in nature and key transformations in organic synthesis. Oxidation reactions are widely utilized in the chemical industry using various oxidizers from molecular oxygen, through hydrogen peroxide, to osmium tetroxide. Employing traceless gaseous reagents over chemicals allows the ability to develop greener processes by reducing the waste from purification, because excess gas can be easily removed from the reaction. Oxidation reactions are important in the synthesis of organic compounds, because these reactions create new functional groups or modify existing functional groups in molecules. However, autooxidations and other reactions with radical intermediates frequently exhibit low chemo- and regioselectivity. Stoichiometric metal oxidants, such as KMnO4 or K2CrO4 generate large quantities of waste. The use of molecular oxygen minimizes chemical waste, producing water as the sole final by-product. The direct oxidation of organic substrates by O2 is rare, as the energy barrier for electron transfer from the organic substrate to the oxidant is usually high. For molecular oxygen, which has a triplet ground state, this high energy barrier is the way of nature to protect organic compounds from destructive oxidation. One of the disadvantages of using molecular oxygen is the difficulty to protect the starting material from over-oxidation. The accurate residence time control in flow chemistry lets the chemist to manage selective oxidation reaction by using the cheapest oxidizing agent. 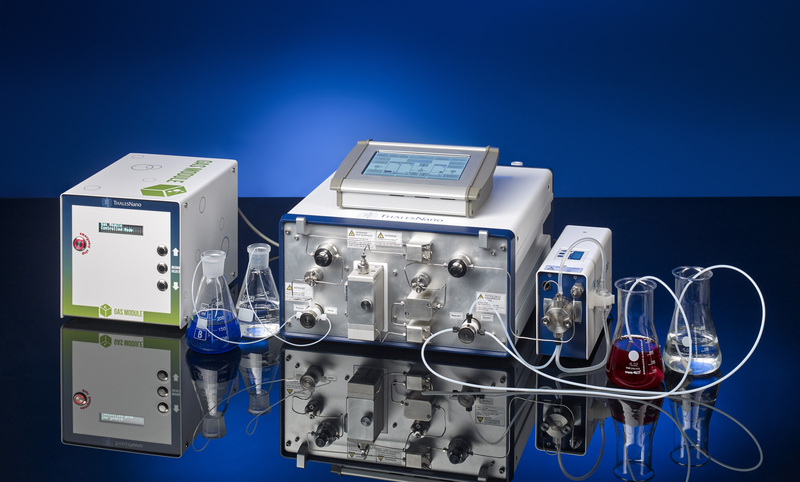 The H-Cube Pro with the Gas Module gives the tool to manage heterogeneously catalyzed oxidation reactions up to 100 bar and 100 mL/min oxygen flow rate.